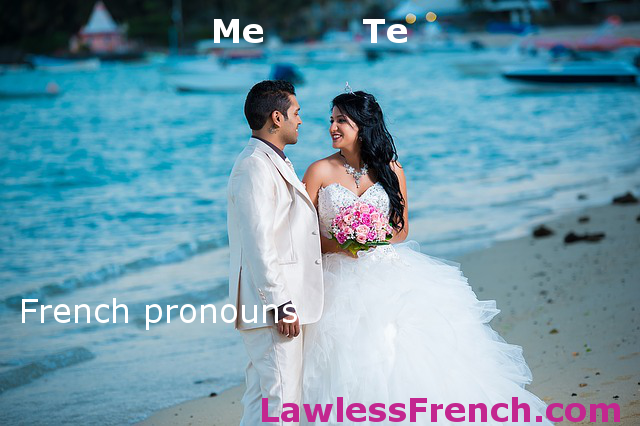 The French pronouns me and te are both three different types of pronouns, with different purposes and translations. They also have different forms. Me is the first person singular direct object pronoun, while te is the second person singular. Tu me connais bien. You know me well. Je te connais bien. I know you well. Likewise, me is the first person singular indirect object pronoun, and te is the second person singular. Tu me souris. You’re smiling at me. Je te souris. I’m smiling at you. Once again, me is the first person singular reflexive pronoun, and te is the second person singular. Je me vois dans tes yeux. I see myself in your eyes. Tu te vois dans mes yeux. You see yourself in my eyes. In front of a vowel or mute h, they contract to m’ and t’. In certain constructions, they become the stressed pronouns moi and toi.